A very absorbing story about a widow with two sons who loses her best friend - and then marries the friend's husband to help him care for this three children, with various difficulties along the way. For anyone of my generation, it is hard to contemplate a blended family like this without thinking about the Brady Bunch. This was published in 1971 which made me check when the Brady Bunch first appeared - 1969. We were there for the first episode, and I remember when Mike and Carol's wedding cake got smashed my mother got up to leave the room, saying, "This show will never last! "Started this book at bedtime: will I ever learn not to read until 2 am? 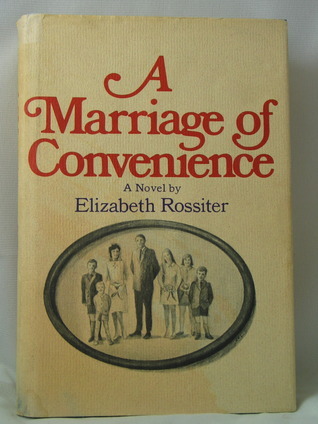 Interesting portrayal of trials and turbulences of a blended family in the late 1960s New Jersey suburb. The story is written from the heroine's POV. From the cover jacket: "Janey, a young widowed school teacher, is struggling to support and bring up her two small sons and coping courageously with her own sadness and loneliness. When Matthew's brilliant wife, Stella, whose friendship and kindness have done much to make life easier for Janey, dies suddenly, he is left with the responsibility of keeping the home together for his three children. Janey agrees to marry Matthew for the children's sake". Their marriage is tested right away by not only what normally would be expected when two families with children try to blend into a new family but also by interference from relatives and friends. From variety of motives they had clawed at the shaky foundation of their marriage, almost bringing it down. Written in 1971, the book provides an interesting study of manners, attitudes, mind-sets of the late 1960s suburbia. I wish the heroine had less self-doubt, the hero groveled more for what he did, and the ending was not so abrupt. This is a long-time favorite of mine. It was originally published as a two-part serial in "Good Housekeeping" magazine in January and February 1972 under the title of "Between Love and Longing". It's the completely absorbing story of a young widow with two sons and a young widower with three children, who marry to provide a stable home for their children. Their first year of marriage is hard, as they have to deal with the feelings of their children and the occasional intrusiveness of their relatives. Meanwhile, Janey, the h, has fallen in love with her new husband, Matthew, but is reluctant to tell him, (she believes he is still in love with his first wife, who had been her friend, Stella). How this story unfolds becomes a fascinating read. Recommended. A couple marries to improve the lives of their children. Then they fall in love. Elizabeth Rossiter - Elizabeth Rossiter started as a journalist and freelance writer, submitting short stories to fiction magazines. She lives in England on the South Coast.